Two partnership agreements were announced at the opening of the Startup Village at the Skolkovo innovation centre on Thursday: one with the Chinese company Kunshan Nano New Material, which makes glass for Apple products, and one with Russian mobile operator Tele2. Tele2's Alexander Provotorov (left) and Skolkovo's Alexei Belyakov. Photo: Sk.ru. The agreements include the founding of research and development centres at Skolkovo by the companies, among other things. Kunshan is a daughter company of Foxconn, one of the world’s leading manufacturers of electronics components, and makes screens and other glass for Apple products. “The glass is cut and polished by our new industrial partner,” said Igor Karavaev, head of Skolkovo’s nuclear technologies cluster, who signed the deal on behalf of the Skolkovo Foundation. “Through our cooperation with this company, we hope to further develop our cooperation with hi-tech leaders, including in China,” he added. 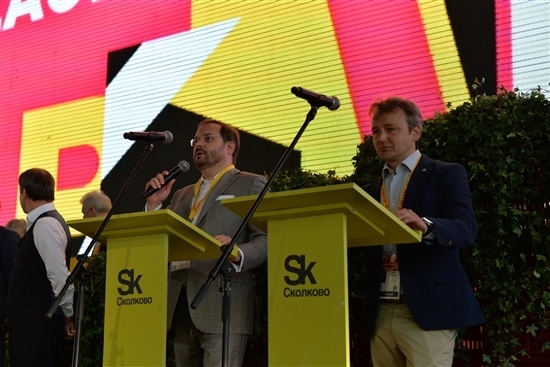 The agreement between Skolkovo and Tele2 was signed by the head of Skolkovo’s space and telecoms cluster, Alexei Belyakov, and Tele2’s first deputy director general, Alexander Provotorov. “Like any telecoms company, we follow what is happening in related areas, in the high-tech sphere, with great interest,” said Provotorov. “Here at Skolkovo, we are taking part in the startup competition jury, and I hope we will be able to select some projects,” he added. Belyakov said it was an honour for Skolkovo to sign an agreement with such a fast-growing telecoms operator. “We expect investment in our startups and the introduction of solutions designed by our startups,” he said. “I’m confident that technology developed at Skolkovo will allow Tele2 to actively develop its business in Russia,” he added.